Preventing aircraft system malfunctions that might lead to an inflight emergency begins with a thorough preflight inspection. In addition to those items normally checked prior to a visual flight rules (VFR) flight, pilots intending to fly under instrument flight rules (IFR) should pay particular attention to the alternator belt, antennas, static wicks, antiicing/ deicing equipment, pitot tube, and static ports. During taxi, verify the operation and accuracy of all flight instruments. In addition, during the run-up, verify that the operation of the pneumatic system(s) is within acceptable parameters. It is critical that all systems are determined to be operational before departing into IFR conditions. When a pilot becomes familiar and comfortable with the new electronic displays, he or she also tends to become more reliant on the system. The system then becomes a primary source of navigation and data acquisition instead of the supplementary source of data as initially intended. Complete reliance on the moving map for navigation becomes a problem during a failure of one, more, or all of the flight display screens. 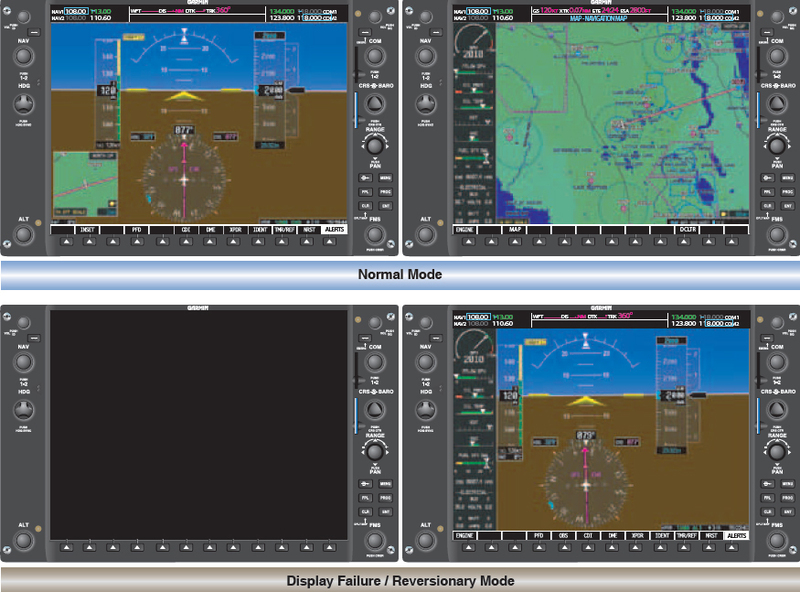 Under these conditions, the systems revert to a composite mode (called reversionary), which eliminates the moving map display and combines the primary flight display (PFD) with the engine indicating system. [Figure 11-3] If a pilot has relied on the display for navigation information and situational awareness, he or she lacks any concept of critical data such as the aircraft’s position, the nearest airport, or proximity to other aircraft. Figure 11-3. G1000 PFD display in normal mode and in the reversionary mode activated upon system failure. The electronic flight display (EFD) is a supplementary source of navigation data and does not replace en route charts. To maintain situational awareness, a pilot must follow the flight on the en route chart while monitoring the PFD. It is important for the pilot to know the location of the closest airport as well as surrounding traffic relative to the location of his or her aircraft. This information becomes critical should the EFD fail. For the pilot who utilizes the electronic database as a substitute for the Airport/Facilities Directory (A/FD), screen failure or loss of electrical power can mean the pilot is no longer able to access airport information. Once the pilot loses the ability to call up airport information, aeronautical decision-making (ADM) is compromised. Figure 11-4. Ammeter (left) and loadmeter (right). 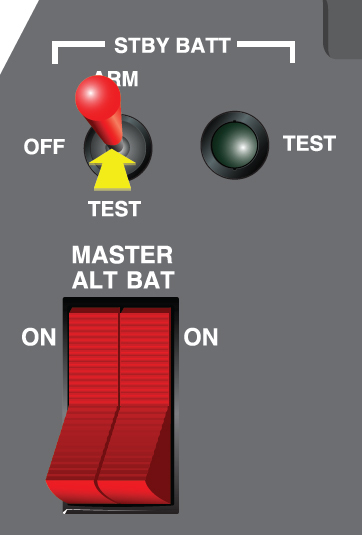 Sometimes an indicator light is also installed in the aircraft to alert the pilot to an alternator failure. On some aircraft, such as the Cessna 172, the light is located on the lower left side making it difficult to see its illumination if charts are open. Ensure that these safety indicators are visible during flight. When a loss of the electrical charging system is experienced, the pilot has approximately 40 minutes of battery life remaining before the system fails entirely. The time mentioned is an approximation and should not be relied upon as specific to all aircraft. In addition, the battery charge that exists in a battery may not be full, altering the time available before electrical exhaustion occurs. At no time should a pilot consider continuing a flight once the electrical charging system has failed. Land at the nearest suitable airport. Figure 11-5. Double rocker switch seen on many aircraft. While en route to the airport of intended landing, reduce the electrical load as much as practical. Turn off all unnecessary electrical items, such as duplicate radios, non-essential lighting, etc. If unable to turn off radios, lights, etc., manually, consider pulling circuit breakers to isolate those pieces of equipment from the electrical system. Maximum time of useful voltage may be between 30 and 40 minutes and is influenced by many factors, that degrade the useful time. With the increase in electrical components being installed in modern technically advanced aircraft, the power supply and the charging system need increased attention and understanding. Traditional round dial aircraft do not rely as heavily on electrical power for the primary six-pack instrumentation. Modern EFDs utilize the electrical system to power the Attitude Heading Reference System (AHRS), air data computer (ADC), engine indicating system (EIS), etc. A loss of an alternator or generator was considered an abnormality in traditionally-equipped aircraft; however, a failure of this magnitude is considered an emergency in technically advanced aircraft. Due to the increased demand for electrical power, it is necessary for manufacturers to install a standby battery in conjunction with the primary battery. The standby battery is held in reserve and kept charged in case of a failure of the charging system and a subsequent exhaustion of the main battery. The standby battery is brought online when the main battery voltage is depleted to a specific value, approximately 19 volts. Generally, the standby battery switch must be in the ARM position for this to occur but pilots should refer to the aircraft flight manual (AFM) for specifics on an aircraft’s electrical system. The standby battery powers the essential bus and allows the PFD to be utilized. One technique for conserving the main battery charge is to fly the aircraft to the airport of intended landing while using the standby battery. A two-position battery master/ alternator rocker switch is installed on most aircraft with EFDs, which can be utilized to isolate the main battery from the electrical system. By switching the MASTER side off, the battery is taken offline and the standby battery comes online to power the essential bus. However, the standby battery switch must be in the ARM position for this to occur. [Figure 11-6] Utilization of the standby battery first reserves the main battery for use when approaching to land. With this technique, electrical power may be available for the use of flaps, gear, lights, etc. Do not rely on any power to be available after the standby battery has exhausted itself. Once the charging system has failed, flight with a powered electrical system is not guaranteed. Figure 11-6. Note the double rocker switch and the standby battery switch in this aircraft. The standby battery must be armed to work correctly; arming should be done prior to departure. While en route to the airport of intended landing, reduce the electrical load as much as practical. Turn off all unnecessary electrical items, such as duplicate radios, non-essential lighting, etc. If unable to turn off radios, lights, etc., manually, consider pulling circuit breakers to isolate those pieces of equipment from the electrical system. Keep in mind that once the standby battery has exhausted its charge, the flight deck may become very dark depending on what time of day the failure occurs. The priority during this emergency situation is landing the aircraft as soon as possible without jeopardizing safety. 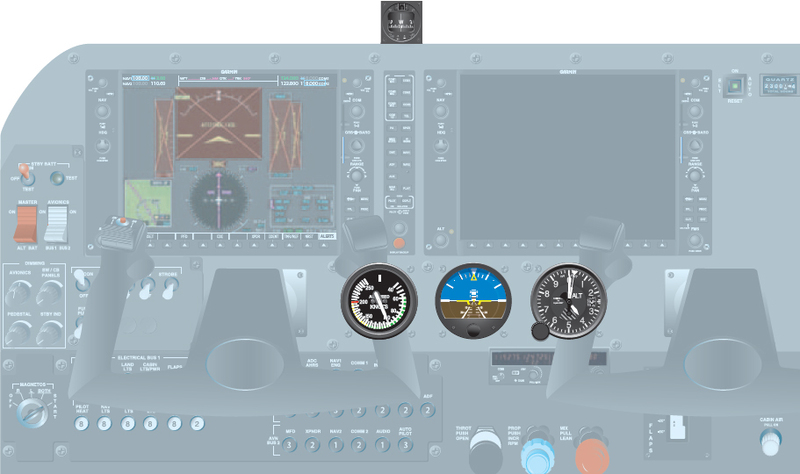 A standby attitude indicator, altimeter, airspeed indicator (ASI) and magnetic compass are installed in each aircraft for use when the PFD instrumentation is unavailable. [Figure 11-7] These would be the only instruments left available to the pilot. Navigation would be limited to pilotage and dead reckoning unless a hand-held transceiver with a global positioning system (GPS)/navigation function is onboard. Figure 11-7. Emergency instrumentation available to the pilot on electronic flight instrumented aircraft. Once an alternator failure has been detected, the pilot must reduce the electrical load on the battery and land as soon as practical. Depending upon the electrical load and condition of the battery, there may be sufficient power available for 45 minutes of flight—or for only a matter of minutes. Pilots should also know which systems on the aircraft are electric and those that continue to operate without electrical power. Pilots can attempt to troubleshoot alternator failure by following the established alternator failure procedure published in the POH/ AFM. 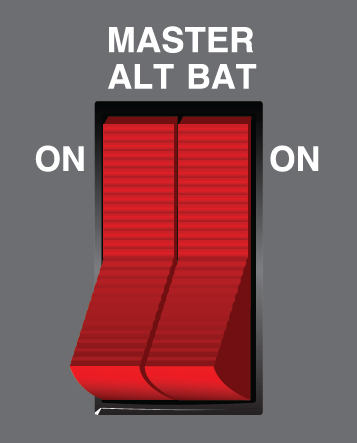 If the alternator cannot be reset, advise ATC of the situation and inform them of the impending electrical failure.